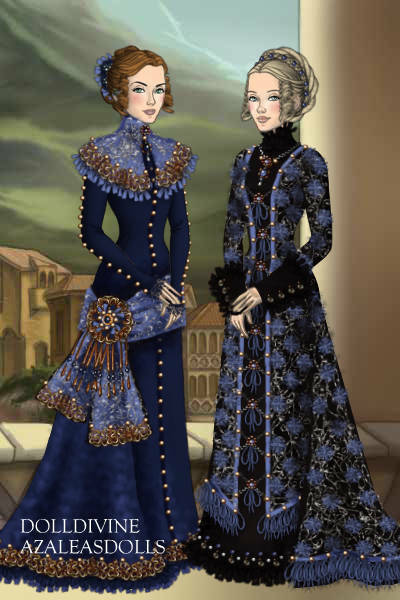 The "princess-line" dress was so called after Princess Alexandra who made the style popular. The gown has no waist seam, rather it is cut from very long pieces stretching from neck until hemline. The construction of a princess-line gown was not easy! What!?! No comments? Anyway: two stunning outfits! Absolutely gorgeous, amazing how you made the pattern, well...you know, everything is amazing! Beautiful!!! How you made the pattern of the right gown with the draggies is great - and the black peace in the middle gives me just an idea. And the left one - the cape ... and the scarf! The golden buttons are a wonderful contrast. Great work, Inanna!!! I've noticed you know a lot about fashion especially of the 1800 era. Is it a hobby or have you studied it? Perfect pair. Im still hoping youll do a tutorial video someday.